Architects, researchers, artists, a DJ, a social scientist and a journalist, are the international team of tutors leading the Berlin unlimited workshop. 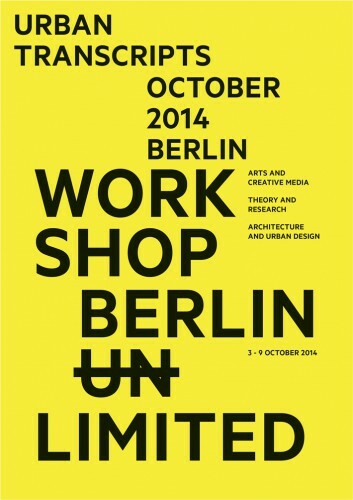 Focusing on Berlin’s actual problematics, the workshop is an interdisciplinary exercise in understanding the urban condition. Each of the 5 units of the workshop focuses on a different methodological approach of urban investigation and is framed by a set of themes, particular to Berlin, to be explored. Urban explorations, on-site visits, and group work, form the key pedagogical elements in each unit, conducted by a team of guest and host tutors: each guest tutor brings in a unique way of looking at the city, while the unit’s host tutors brings in a thematic framework specific to the local content of Berlin. Additionally, the workshop includes a series of transversal activities, such as lectures, film screenings, and social events. The workshop’s main objective is to equip participants with a sharpened vision through which to comprehend the city as a complex interactive system. It aims towards the development of collaborative strategies that challenge conventional methods of urban analysis and cut through disciplinary boundaries, encouraging creativity and originality. Part of the Berlin Unlimited festival, a project by Urban Transcripts, Collagelab, and Guerilla Architects.